Swire Pacific Offshore ordered another four IMT966 anchor handlers to the IMT Marine Consultants design. 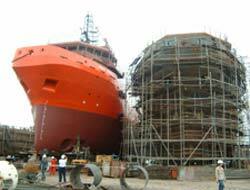 These follow six similar vessels already under construction at Labroy Shipyards, Singapore. Scotland-based IMT Marine Consultants, partner in the Offshore Ship Designers Group, was responsible for the design of these innovative and powerful vessels. The 120-ton bollard pull vessels are optimized for world-wide service of offshore towage, anchor handling and logistics support activities in all weather conditions. One remarkable feature of the design is that the upper part of the bridge deck can be removed and stored on the main deck for passage into the Caspian Sea. The vessel’s beam is optimised for Caspian Sea passage. The vessel is propelled by two CPP propellers giving it a maximum speed of 14.5 knots. The design features two bowthrusters and two stern thrusters of 600 kW each for joystick controlled DP operations. The Pacific Valhalla will be the first vessel to be delivered and is scheduled in August 2007 with subsequent vessels being delivered at two monthly intervals afterwards.